Fresh off a preview of the Nike LeBron 15 this past week, LeBron and Nike have more special surprises in store. 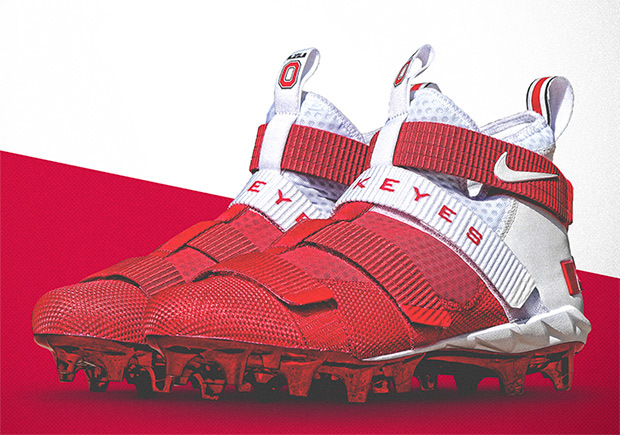 The nation’s number 2 ranked Ohio State Buckeyes will take on the number 5 ranked Oklahoma Sooners this weekend marking one of the University’s biggest games in the early goings of the season, and LeBron helped out his favorite football school with their very own Nike LeBron Soldier 11 PE cleats. The exclusives feature a color split upper ranging from white and red mesh while the Buckeyes’ helmet stripes are featured on the heel tabs. ‘Buckeyes’ is even written on one of the overlaying straps. Check out more photos below and stay tuned for more NCAA exclusive cleats throughout the season right here on Sneaker News.